You may have less square footage than a house, but these 12 apartment storage ideas will help you to hold on to the things that you love and stay organized. Take a vertical leap – In a smaller space, you will want to organize your storage on the vertical rather than the horizontal. Use hooks to hang things on walls and inside of closets. Install tall cabinets and bookcases with more shelves. Be a basket case – Baskets are decorative and versatile. You can use them anywhere to store dry items and reduce clutter. Bring down the curtain – Traditional doors use up floor space to open and close. Hang a curtain to cover a closet or small room. It will slide rather than swing to allow access. Embrace your inner furniture – Many furniture items have storage options. Ottomans, coffee tables, and benches often have space for storage inside or underneath. Mix and match – Over the door closet organizers such as those used for shoes can store any item that fits the pocket. Use your imagination. Sweep it under the bed – If your bed is resting on legs, you may have unused space under there. Bed risers boost the height of your bed for additional space. There is a variety of under the bed storage containers on the market. Take a shower – There are many kinds of shower caddies available that serve as storage for bottles, razors, and sponges. Some shower curtains also have mesh pockets. If you are crafty, you can add some. Book it – If you love your books, you will know the challenge of where to keep them. Fortunately, books look nice, so use them to decorate. When stacked next to a chair, larger books make a convenient side table. Create some tension – Tension rods come in different lengths and can increase hanging potential in any cupboard or closet. You can also use them to hang curtains to partition a space. Peg it – You can use pegboard in any room to convert a blank wall into storage space. It can be purchased or cut to fit and has a variety of purposes. Make an entrance – Provide hooks, shelves, and storage at the entrance to reduce clutter. If things like hats, jackets, and purses have an assigned place in the entry, they are less likely to creep into your living space. Do your homework – There is an abundance of storage solutions on the market today. Spend some time researching new gadgets to fight the clutter. It may also spark some DIY ideas that can save you cash. Try these 12 apartment storage ideas to make the most of your space and reflect your style. You do not need a huge amount of square footage to relax and appreciate your living space. You can protect your apartment from house fires with some easy to follow fire safety tips. Fire protection safety tips include simple things to do that keep a home safe throughout the year, including identifying fire escape routes and general fire protection safety. Don’t leave items in the stove or on the range unattended while cooking to prevent house fires. Keep flammable items including cleaners, solvents and paper or fabric away from the stove at all times. One of the best fire safety tips includes extinguishing candles when leaving the room. Don’t leave them burning, even if occupants will be gone “for just a minute.” Make sure candles are completely out when retiring for the evening. Prevent house fires by ensuring smokers exercise some caution. Never smoke in bed and be wary of vintage bedspreads, linens and carpets, which are often flammable. Don’t leave the room when a cigarette is burning and prevent smoldering embers in ashtrays from setting fire to the garbage by running water in the ashtray before throwing away the ashes. Be aware of fire prevention rules when using fireworks outside the house. Keep a bucket of water and a hose at the ready in case they are needed and stay away from patches of dry grass. Exercise caution when lighting fireworks and make sure friends and family only watch the display from afar. Summer fire safety tips include keeping a careful watch on the barbecue. The National Fire Data Center estimates grills are the cause of more than 6,000 fires every year. Douse coals after use and don’t overdo it with the lighter fluid; sometimes barbecue fires can be hard to start, but they will flame up hours later. Don’t overfill propane tanks and ensure that the fuel line connection is solid before using a gas grill. Keep all grills in open areas to prevent carbon monoxide poisoning. Identify all of the fire escape routes in a home. Determine whether the home needs additional fire escapes or portable fire ladders added to any room in the house. Plan escape routes in case of a fire; it’s one of the best fire protection systems available for a house. Make sure everyone knows what to do in case of a fire, and consider doing some practice fire drills in the home, too. Smoke detectors and home fire alarms can help prevent injuries in case of a fire. Smoke detectors are inexpensive and sometimes available for free from the local fire department, and they are still one of the best fire protection systems available. Test smoke detectors and home fire alarms when changing the clocks in the spring and fall; it’s an easy way to remember that “it’s time” to keep a house safe. If you rent your home or apartment, you need renter’s insurance to protect yourself and your possessions. Many renters wrongly assume that their landlords carry insurance that will replace the items in the home or apartment in the event of a disaster, but for the most part this is not the case. While landlords do indeed carry insurance on the properties they own, that insurance covers the physical structure itself, not the items contained within each individual apartment. If the apartment building burns down, suffers flooding or falls victim to some other natural disaster, you will not be able to rely on the landlord’s insurance to protect your belongings. Renter’s insurance is designed to fill in the gap between the coverage the landlord has for the building and your own individual needs. Renter’s insurance is generally very inexpensive, so there is no excuse for not carrying it. If you are in the market for renter’s insurance, you need to make sure you are getting the best deal for your money and that you have the coverage you think you do. As with any type of insurance purchase, you need to do your own due diligence and research your coverage options carefully. One of the most important things to look at when choosing a policy is the extent of your coverage. Some policies will pay the actual cost of items that are damaged or stolen, while others provide full replacement cost. That distinction can be very important, especially if you own a lot of electronics and computer equipment. Items like televisions, laptops and tablets can depreciate quite rapidly, and that $1,000 flat-screen TV you bought a few years ago might only fetch $200 in today’s market. If you opt for actual value coverage, you could be out $800 when it comes time to replace a lost television. Renter’s insurance pays for more than just the items inside your apartment. If you are displaced due to a fire or other natural disaster, your renter’s insurance policy may pay part or all of your living expenses. The policy may reimburse you for the cost of a hotel room or pay for the cost of moving to another apartment. It is important to read the policy carefully and understand exactly which living expenses are, and are not, covered. In addition to paying for living expenses and reimbursing you for lost items, your renter’s insurance policy has another important feature. Renter’s insurance also provides liability insurance if someone is injured on your property. This liability insurance is similar to the coverage provided under homeowners’ insurance policies. As with property reimbursement and living expenses, it is important to understand the limitations of your liability coverage. You need to know how much coverage the policy provides and under what circumstances you will be covered. If the policy does not provide enough protection, you may be able to increase your liability limits to get the protection you need. Renter’s insurance is an important purchase, and not one to be taken lightly. Taking the time to understand your coverage and read the fine print carefully is the best way to make sure you have the protection you need. Simple changes can make a big dent in your monthly expenses. 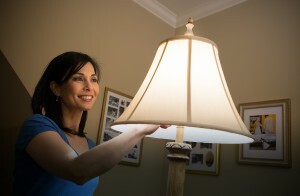 Just use these simple tips to get started and see your energy consumption and bills go down! Take a tour through your apartment and make a list of all your light bulbs and their wattages. Then go shopping for new compact florescent or LED bulbs. You can save a lot of money simply by replacing those old light bulbs with newer more energy efficient versions. You can save even more money by looking for sales and stocking up on light bulbs at reduced prices. Compact florescent and LED light bulbs last longer than traditional models, but it never hurts to have a few spares on hand. If you use a window air conditioner to cool your apartment, be sure it is well insulated. Check for gaps around the unit that could let cool air out and cost you extra money. Use foam insulation to seal those gaps and keep the cold air in your home. If you must leave the window unit in over the winter, use a tight-fitting air conditioner cover. Better yet, find a spot to store the unit for the winter. Electronic devices like computers, televisions and gaming consoles play an increasingly large role in monthly energy bills these days. You can trim those expenses by watching how you use those devices. Use a power strip for devices that require frequent charging – things like cell phones and tablets. Turning the power strip off when charging is complete can save you money without sacrificing convenience. You can save even more by shutting down your computer when you will not be needing it for a few hours. Shutting down your PC will not harm the components, but it will save you money. Whether you use baseboards or registers for heat, make sure the surrounding areas are kept clear. Stacking furniture up against baseboards and placing clothes over registers creates a fire hazard — and wastes electricity. Those registers and baseboards need free air flow to work efficiently. Move furniture as far away as possible and make sure curtains do not hang near the heat. Be sure to vacuum those registers and baseboard units often to keep them free of dust. An accumulation of dust and debris can reduce the amount of heat that makes it into the room. You can save money on laundry day by washing only full loads. Buying a drying rack for your apartment and consider using the dryers only for heavy items when necessary. With the temperature going up again in Minneapolis, we have a few tips from our friends at Apartment Therapy to help you keep the heat at bay! Keep the curtains or the shutters closed: Keeping the sun from streaming directly in helps keep your place a little cooler. Hang a wet sheet in front of the window: when the air passes through the damp cloth, the moisture cools it off. In the same vein, try a bowl of ice in front of a fan: Let the cool air blow over you. Turn your fan around to face out: And blow the hot air out of the house. If you have a ceiling fan, turn it so it spins in the opposite direction and blows the hot air up and out. Arm yourself with a spray bottle filled with chilled water: Douse yourself liberally. As the water evaporates, it cools you down. You can also try plunging your hands into a bowl of ice water. For more tips, visit Apartment Therapy!